I met George (GW) in 1976 when he gave a talk to another organisation, now defunct. I liked what he had to say and engaged him in private conversation at the end. When the meeting closed completely he took me away in a car to his shop in Upper Street, Islington, where we continued to talk about the same things, that is, the interaction of different political groups and the splits within groups of socialists. Eventually he drove me home but we had swapped names and addresses and I later received information about the monthly meetings of the Walsby Society (WS) at his house in Highgate. I thought I was too busy to get involved in yet another group but I started to go generally and read their documents, mainly produced by George himself. I said very little at the early meetings because I was hearing ideas based on books and speakers that I had never heard of. Slowly I got drawn in to learn -more about the origins of this group formerly within the Socialist Party of Great Britain and the development of a theory based on Hegelian ideas which had very wide applicability. The group also organised an annual Walsby Memorial Lecture in London for which someone in the academic world would be invited to speak after being lent a copy of Walsby’ s book The Domain of Ideologies. This was financed by inviting the group members to contributed voluntarily. A general pattern became evident to me that George did almost all the writing of documents and circulated them using the facilities of his business. He had earned his living for many years by sending out printed lists of books for sale and he could easily use his printing machines and a few employees to circulate other similar documents. Most of the administration for all functions was done by Peter Rollings, lecturer in sociology, using the facilities available to him at Reading University. The other regular attenders at meetings would contribute money and engage in vigorous debate but their output of written material was small or non-existent. This group was generating ideas and discussion to rival anything in the academic world but it had very little contact with the mainstream academic world and was not getting its work published in mainstream journals. When I refer to administration of the Walsby Society this should not be taken to refer to a formal structure with elected officials. The group was small and expected to remain so (see “The Ideological Pyramid” on page 3). Administration was ad hoc using volunteers. There was no subscription and no bureaucracy. Anyone could organise a meeting and publicise it and hope that others turned up. In practice Peter Rollings was using his academic contacts to provide speakers and no-one else did much administration. NB: Peter Rollings changed his surname to Shepherd shortly after I met him and he will be referred to as Peter Shepherd (PS) from now on. The group appeared to be stable and progressing but changes were taking place slowly. In January 1978 the regular monthly meeting place changed from Highgate to Ealing, the home of Jack and (wife) Bobby Taylor. That could be seen as a natural change to give George and wife a rest from a monthly commitment but it was more than that, as I found out slowly. At the new meeting place George was less likely to turn up but meetings continued. 1978 became a significant year to this group because of George’s work to start the Project for Systematic Ideology (PSI). He envisaged PSI as a separate group which would take the theory outwards as distinct from the WS which he expected to stay as a discussion group concentrating on theory. Whereas the most significant statement to the WS would be ‘Nothing is Absolutely True,’ George wanted PSI to use ‘Everything is Relatively True’ as a starting point to make contact with other groups and try to build a wider understanding of the place of people and groups in a multi-layered ideological structure. George arranged the inaugural meeting on 10th May 1978 and turned up with a document with five principles. He was elected as Secretary but then resigned the next day. He said he wanted a group formed to do something practical and he did not want to spend more time on theory in that group. He objected to the other people questioning the five principles from the start rather than sounding more positive about other activities. The other people involved then considered what to do about PSI without George and came to the conclusion that they would have to leave it to the man himself who was the instigator. They therefore wound up the original PSI in July 1978, including announcing that they did not wish to hold the name in reserve. George was then free to start his own PSI from August 1978. George’s PSI ran from August 1978 to September 1979 with its own mailing list and a small subscription. In that time George, with help from a few others, called publicly-announced meetings at home or elsewhere and these were thought to be successful in attracting a few newcomers as well as the regular WS members. George also circulated seven PSI Circulars and published Ideologies and their Functions (I&F) at this time. Looking back at the circulars now, it is apparent that they were the precursor to Ideological Commentary (IC). They were one or three sheets of yellow paper with a mixture of items ranging from one-line jokes to one-page comments on current affairs. In September 1979 George put PSI into abeyance with a summary of what had been achieved in the year and an offer to pass the mailing list over to anyone who wanted it. No-one did as far as I know. Immediately after that George started Ideological Commentary as a regular publication (No.1, October 1979) and slightly reduced the frequency of producing one-off publications. The first two issues had the names of three consulting editors on the cover. The first three issues had the dates of Walsby Society meetings on the cover. After that it ceased to refer to the WS and became George’s sole responsibility from IC 4, January 1980. While all that was going on in 1978/9 Peter Shepherd was making long-term plans to leave GB for a teaching post in southern Africa and was making plans to leave the WS to continue without his input. As a result he started to convene an Events Committee to get a group of people to think about possible speakers a few meetings ahead with a view to leaving it as the basis of a collective responsibility when he left. The first meeting took place on 2nd November 1978. Also in November was a Braziers weekend (11-12th), a monthly WS meeting (15th) and a WS Systematic Ideology study group meeting (23rd) in preparation for a term of evening classes that PS intended to give at City University from January to March 1979. George objected to the existence of the Events Committee and never attended it so he was not up-to-date with what had been decided. With the same number of people being invited to attend WS and PSI and other meetings it was inevitable that there would be a few clashes of meetings. That was an irritation rather than a serious matter but it now appears that the same small number of people was being overloaded with choice of events in 1978/9. The evening course did run for ten weeks from January to March 1979 with topics to suit the WS members but an attempt to continue it the following term with a range of subjects intended to attract outsiders was ended after two weeks because of insufficient support. Relations between GW and PS appeared to deteriorate slowly partly as a result of the existence of the Events Committee and, more importantly, George’s growing opinion that the WS had stopped discussing systematic ideology (SI) and become a sociological discussion group. That was not simply a result of a sociology lecturer inviting people with a similar background to talk. It was also George’s opinion that the regular attenders were not trying to develop the theory in relation to talks at the WS meetings. For the subjects introduced at a monthly meeting there were plenty of possibilities of rambling round psychology, sociology and politics instead of SI. George grew to think the WS was a liability rather than an asset to the development of SI so he ignored it and went his own way. 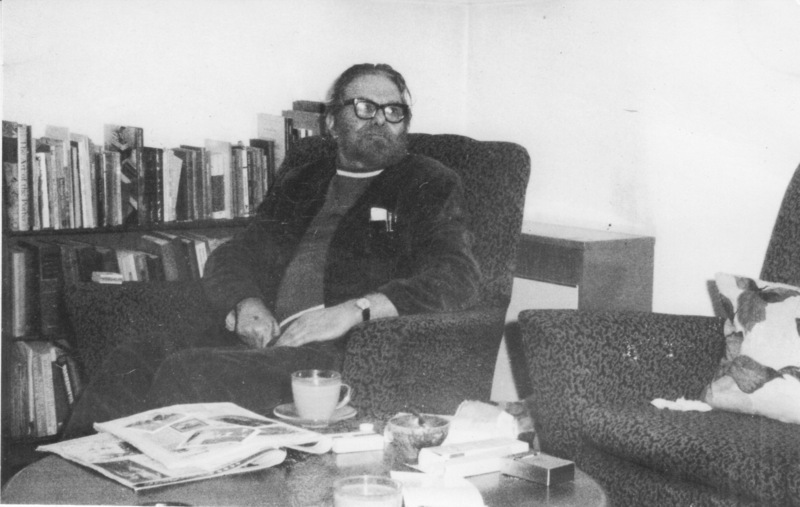 The last WS meeting at Jack Taylor’s house was in August 1979. After that they became peripatetic. Anyone in London who appeared interested and had a room large enough to accommodate a group would be drawn in to hold one. Eventually PS did leave GB for Swaziland and I (ARW) took over to distribute notice of monthly meetings from September 1980 to a small mailing list, many of whom were never seen and not in contact. Having asked for small financial contributions I stopped circulating the people who both did not contribute and made no contact. No-one complained. Meetings continued for one/two years and I tried to introduce topics which were more related to SI as I understood it. Various people would ask at meetings if George was going to turn up and I would tell them why he did not. They could have asked him themselves. George did turn up occasionally and even said once “The group has started discussing ideology again.” The last regular meeting took place in April 1982. Anyone could have taken over the job/chore of picking a place/topic and circulating members but no-one did. Progress remained as mainly George’s effort acting through IC and other documents. There were no Walsby Memorial Lectures or Braziers weekends after Peter Shepherd left GB; the last memorial lecture was in May 1980. Beside group meetings it was possible to learn about SI in personal contact with George. I had various meetings with him over 18 years but he became impatient if people showed no sign of trying to develop the theory when also acting as if they believed/understood it. He thought that applied to me at times. The fact that I belong to a political party and have stood for election could be taken to show that I was not concentrating on SI. George belonged to no party and no outside body that would take more than the minimum of time. He did not want to be diverted into other fields of study and he obviously felt some sense of urgency, not only related to his own age. He occasionally referred to the growth of the National Front in Great Britain as a worrying sign in the early 1980s. He had seen Fascism spread in the 1930s and he thought SI had a small part to play in a very indirect way in stopping Nazi/Fascist ideas spreading again. My own acceptance of SI as a good description of the way societies develop and groups interact derived from a course of evening classes at City University in late 1980. The subject was philosophy of science and the lecturer was David Murray. I discussed some of this course with George including the book The Structure of Scientific Revolutions by T. S. Kuhn. George had previously come across the book, thought it was significant, and, he said, he had bought a few copies to hand out to his old contacts. It was the fact that they did not apparently see the significance of the book that first set him thinking that the old guard of the WS were not taking the theory seriously and were not going to develop it. Kuhn’s book shows the interaction of the parastatic (precision) and epidynamic (revolution) versions of physical sciences. It remains significant as the first English language book to demonstrate so clearly an ideological interaction without the author knowing the theory of SI and in a field of study where most scientists and philosophers think ideology is irrelevant. It also leads straight to a question derived from SI which Kuhn would not have asked. Ideo-groups interact mainly with the group either side of them in the developmental pattern thus the parastatic only has a weak interaction with the epidynamic. Where is the protodynamic version of science to interact with both the others? George was of the opinion that there must be a lot more reforms of scientific theories than most scientists or philosophers of science are aware of before the final crisis of a theory which leads to a recognizable revolution in theory. As far as I know no-one has done the analysis to back that up. My previous education was in physical sciences and I had picked up a bit of psychology. I was aware that the word ‘ideology’ is used by social psychologists, sociologists and political scientists so I tended at that time to think SI was primarily a relative of those subjects. After the course on philosophy of science I tended to think of SI as mainly related to philosophy and logic with a wide applicability to all other subjects. George agreed with that. He liked the sound of the course at City University so he attended for the second term and got into more discussions with the lecturer than anyone else. David Murray did not simply layout other people’s theory: he was prepared to argue his own case. He was a Marxist and would not be convinced by any of George’s arguments which he read at length after being put on the mailing list for SI. George knew all the Marxist arguments from the 1930/40s and he would not be convinced, in reverse. I kept on going to evening classes at City University and elsewhere to cover basic philosophy and psychodynamic theories (Freud, Jung). I now believe it is not possible for anyone to understand SI unless they have the basic knowledge of the last 2500 years of western philosophy and of psychodynamic theory. It is not necessary to believe all of it or to try to keep up with recent developments. IC had only three issues between November 1980 and August 1984 for which there is no real explanation. At that time we generally circulated Outline Sketch (pamphlet) or Ideologies and their Functions (I&F, book) to people who showed an interest but George grew dissatisfied with I&F and stopped circulating it even though he presumably had spare copies. I once tried to encourage George to restart IC by offering a bit of money with an article but George was not going to be rushed and he did not need the money. Eventually he restarted IC as a regular publication and later he started to ask for a low subscription. The cost was not covered by the subscription and a few statements in IC (or verbal) show that he wanted to eliminate from the mailing list the people who were really not interested. That does not mean that he eliminated everyone who disagreed with him. Most people who paid and argued with him would stay on the list. Readers should bear this in mind. Not everyone who has been asked to contribute to this book of collected papers accepts the theory . A notable and useful contact was the Israeli Professor of Education, Zvi Lamm, who came across I&F by chance and pursued a contact with George. Not only did he contact George at his bookshop when in London but he went on to write a paper in the academic literature which was useful to refer to with later contacts. (Lamm, 1984) It summarises the theory as it was at the time and that bit can be regarded as slightly out of date, particularly in relation to the protostatic (expedient) attitude to politics. It is particularly important in its placing of Walsby’s work in relation to Marx and Mannheim and emphasising that Walsby’s theory accounts for itself whereas no other theory of ideology does so. Somewhat later George stopped using the formal (Ipsden) terminology in his writings and started using a more informal terminology, namely ‘expediency, principle, precision, reform, revolution, repudiation, criticism’ for the major groups. The words were adjustable to a small extent but one thing was constant: George thought that the formal terminology was putting people off and he would have to make the effort to make the whole theory look more comprehensible to newcomers. That does not mean that George disagreed with the formal terminology. He appreciated that it allowed the exponents of Walsbian theory to move away from the complicated philosophical terminology as used in Domain of Ideologies. When giving a set of three talks shortly after putting PSI into abeyance George had tried referring to ideo-groups by the colours associated with them in the British/European political manifestations, namely brown, blue, orange, pink, red, black. Those talks were reported in IC 2 and the terminology was used again in IC 3 and 4. After that George sometimes used Ipsden terminology and sometimes avoided any terminology for specific groups. The first reference to the newer terms that I can find is in IC 39, (May 1989) in an article that looks like a precursor of Beyond Politics (BP) which made no use of Ipsden terminology at all. Another issue on which I had contact with George was that of creating an index for IC. I had suggested the need for an index a few years ago and George, in his usual way, said “I’ll publish it as soon as you do it.” At that time I had no easy access to word processors and did not like the idea so I tended to write my own abbreviated summary of what was in any issue on the front cover next to George’s titles which were often joky and allusive rather than a simple title. Later even George found it too much work to keep flicking through IC to find what he needed so he reminded me of my suggestion and I agreed to do it, hoping it would be a few weeks or months work on a word processor. I had never done an index before and under-estimated the work required to do it after the journal is all published and it cannot be done by automatic index and sort procedures on a word processor. I never finished it before George died and I still have not finished it. IC became regular from August 1984 and yet George still found time to give talks to many groups, with associated written articles, and to write another book (BP). I wrote a few articles he published and a few he rejected. The rejections were based on his appraisal of their quality and relevance. He took the view that the opportunity for publishing anything about SI was very limited and other material could go elsewhere. He very much controlled what he published in IC to avoid anything that did not match his idea of ideological analysis. Even allowing for the work of mine that he refused my written work is meagre compared to his. His output was surprising. – He was energetic in everything he did including his non-intellectual recreational activities that I knew little about. All we can do now is to continue the work as best we can. Ref: Lamm, Z. (1984), Ideologies in a Hierarchical Order: a Neglected Theory, Science and Public Policy, 11(1), 40-46.